Colony coming through with a fresh unboxing and build up of one of their brand new 2018 Endeavour complete bikes! The video features Dave Dillewaard putting the bike together piece by piece, with a close up look at some of the different parts found on the bike! Based off the video, it looks like a real dialed BMX bike to us! Check it out then hit up your favorite Colony dealer to pick one up! “Unboxing & build of a 2018 Colony Endeavour complete bike in the Red / Polished colourway. Available now across the globe. Curious what Dave Dillewaard is running for a setup these days? Check out this fresh video bike check giving you a look at his current Cult setup decked out with Demolition parts! 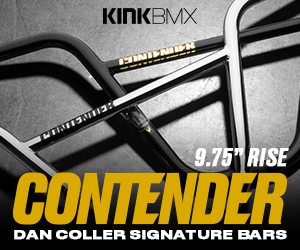 Looks like a real dialed BMX bike to us! “Dave was a part of the GT team for eleven years and parted ways with them in 2015. It’s been a few months, but still seems pretty surreal to see him on a different bike. Check out his new Cult, watch him shred some SoCal concrete, and bid him godspeed as says farewell to the United States. Can’t go wrong with some fresh Dave Dillewaard footage! Check him out putting in work on parks and spots he came across out in the desert! With the temps dropping up here in the northern hemisphere, some of you might just be considering a trip down under for the heat and sunshine we’re missing out on! Dave Dillewaard sat down to tell you about some of the pros and cons of visiting Australia so you are prepared if you decide to take the trip! Always stoked on some fresh Dave Dillewaard footage! Check out this new one GT dropped of Dave getting some time on some street spots, parks and dirt out in California to promote his signature DLSY frame and complete bike! GT sent Jeremiah Smith, Rob Wise, Dave Dillewaard and new their new flow rider, Jonesy Fedderson, out to Colorado with a new GoPro Hero 3+ where they cruised a bunch of their dialed cement parks and a little street! Check out the video they came back from the trip with! One of my favorite sections from the “Coppin’ It Sweet” DVD is now online for your viewing pleasure! This mix section is loaded with fire from Tom Stretton, Mick Bayzand, Kym Grosser, Steve Lyons, Alex Hiam, Jason Watts, Chris Finnigan, Rob Wise, Cooper Brownlee, Chris “Danger” O’Donnell, Ryan “Biz” Jordan, Jack Elkins, Dave Dillewaard, Zac Miner, Pete Radvio, Chris Courtenay, Daniel Johnson, Dylan White, Renald McQueen, Carraig Troy and Anton Ayres! Check it!